We usually wait for the first week of June to publish the first edition of a new season's newsletter, but several items of mid-winter news might be of interest to our readers. A class about Sustainable Communities at RIT is studying the area around the Market. We are hoping that a few of our readers will be willing to be interviewed for this study. A part time employee of SEAC will be helping us to expand our advertising this year. It looks like EBT problems have been solved. The Monroe Avenue Corridor and its surrounding neighborhoods, sometimes called the "Monroe Village", is a highly prized area in which to live and work. We have been asked to participate in a study of our community. Professor Anne Howard teaches at RIT and studies community structures and dynamics. She conducts a class called "Sustainable Communities" and would like her students to study and analyze the Monroe Village. The students will tour our area by bus, and they would like to conduct interviews with people associated with the Farmers Market (vendors, volunteers, shoppers, musicians, residents, nearby business operators,etc) on Tuesday, March 19 or Tuesday, April 2 (changed from Tues, March 26). Space has been reserved on the second floor of the Monroe YMCA from 1:00 pm to 3:00 pm on both days. Any time that you might be able to commit to these interviews would be greatly appreciated. At the end of the semester, the students will present their findings and relate them to current theories about community vitality and development. We will get copies of those reports, and those interested in attending the oral reports at RIT will be able to attend. We have a chance to teach and learn something about what makes our community tick with its current vitality and how we might consciously preserve and expand its appeal. Please contact Jesse Knoth by phone at SEAC (210-9140) or email jknoth@seacrochester.org if you can participate in the study by answering questions and talking with Prof. Howard's students on either day. SEAC has hired a new, part-time employee, Allie, and some of her time will be devoted to promotion of the Farmers Market. Jesse, the Executive Director, will be helping, too! 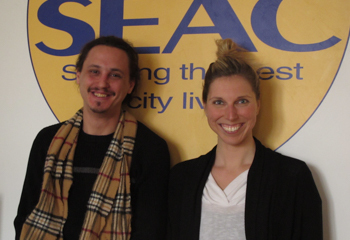 Allie lives in the Upper Monroe Neighborhood and is SEAC's Program Outreach Coordinator. She will be helping with the formation of advertising materials and their distribution, social media, and sponsorships. She plans to attend the Market; make sure to look for her and to introduce yourself! Towards the end of last year, we were unable to handle EBT transactions because of a breakdown in funding from the USDA which had supported a key supplier of EBT banking services. Due to the leadership of the State of New York, wireless EBT banking services will be again available to Farmers Markets this year. We expect to be using an Android or iPhone tablet to scan cards rather than the dedicated card scanner that we were using in previous years. Check us out on MonroeVillageFarmersMarket for updates and pictures! The market has always welcomed shoppers in the various State and Federal supplemental nutrition programs. Farmers at our Market accept tokens and some coupons. See the Market-Day supervisor; bring your EBT card. See USDA SNAP guidelines for more information. Looking to help the Market this summer? We can really use your support! You can commit up to one hour this summer, or a few weeks, any help is appreciated! Think about helping with Market Day photography, opening and closing, or lawn signs! Contact the Market Manager, Allen Krisiloff at allen@triptar.com for more details. Sent weekly from June through October.